The beautiful Turtle Dove is our smallest European dove. This tiny power house of a bird flies 7000 miles to reach North Yorkshire from Mali in Africa each spring. Unfortunately Turtle Doves are in big trouble; their population has declined in both the UK and Europe to such an extent there may now be fewer than 100 birds nesting in the whole of Yorkshire. Only fifty years ago it was classed as a fairly common bird. 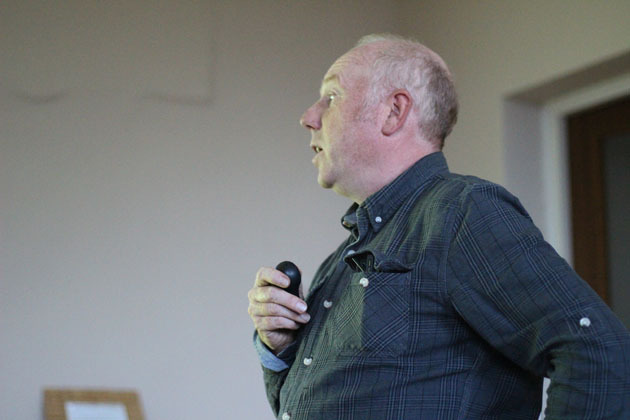 At the Ryedale Natural History Society’s meeting last night I listened to Richard Baines – the man behind the North Yorkshire Turtle Dove Project – give a talk about what the project has achieved, its ongoing plans and how we can help. 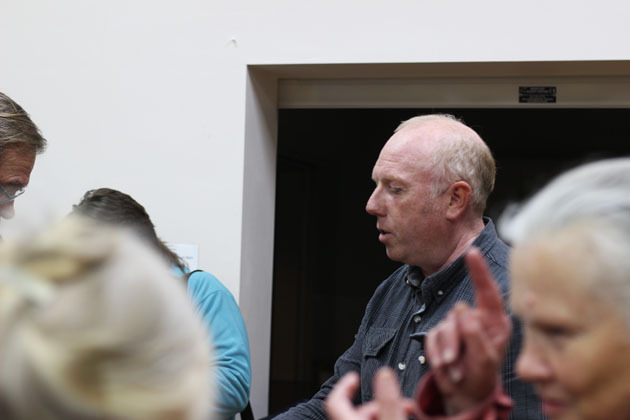 It was a lovely gathering at the meeting, which opened with members, in turn, enthusiastically describe their wildlife sightings that week, birds, mammals, reptiles and plants. General discussion about the lateness of the spring, but swallows had been seen and remarks were made about the abundance of frogs. Richard then presented us with a fascinating overview of his work, and that of his volunteers on the North Yorkshire Turtle Dove Project. It is a successful project, attracting Heritage Lottery Funding and working in partnership with the Forestry Commission, RSPB, Howardian Hills, North Yorkshire Moors National Park, Scarborough Borough and the North and East Yorkshire Ecological Data Centre – all these organisations and groups contributing and pulling together to halt the decline in Turtle Dove numbers, so it becomes again a familiar site in the British countryside. We’re so lucky to have this little population of Turtle Doves in North Yorkshire, which it seems are the most northerly found birds in Europe. They seem to be eeking out an existence at the edges of our forests here, helped, monitored and researched by the Project. 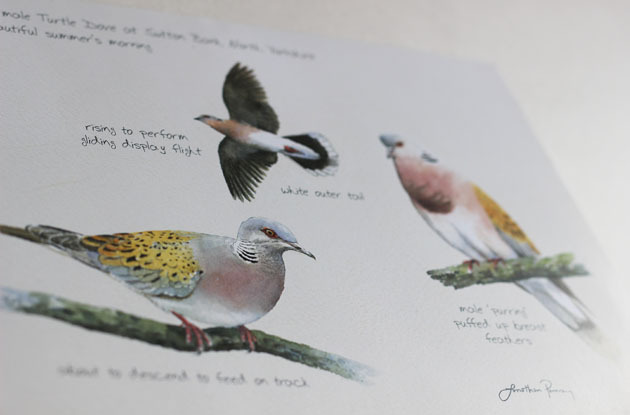 I feel very proud of its work, and proud of our North Yorkshire Turtle Doves. I hope consideration for this little group of birds isn’t too late, and that messages such as this, which we hear of almost daily, and the Turtle Doves are saying loud and clear, we must look after our environment with greater care. Listening to Richard and his dedication, I’m enthused to join in helping. Look afresh at my bird feeding place. Ensure I clean feeders meticulously and regularly to avoid disease (see note below). Fill feeders with good quality small seed bird food. Grow some climbers up the hedge – wild clematis, honeysuckle and bramble. Let the hedge become thicker, taller, wider. Turtle Doves are very prone to Trichomonosis (canker) Trichomonas gallinae affects bird’s digestive system. It typically affects finches, and doves and pigeons. Trichomonosis causes lesions in the throat of the infected bird, which makes it progressively harder for the bird to swallow its food. The male Turtle Dove has a beautiful repeated churring song. Turtle Doves love dew ponds. Favoured foods – Fumitory, Chickweed and Birds Foot Trefoil. They like to walk on sparse and open planting, patches of bare ground amongst their food source, and open patches of short grass. They love tiny seeds foraged from flower meadows. The feeding habitat turtle doves need is best achieved by providing cultivated strips or plots. These areas can be created by repeatedly disturbing the soil through rotavating or simply digging over to prepare a fine tilth to sow the seed mix. After sowing, lightly rake the soil, then tread or roll to firm the seed bed. Cultivations should take place in the autumn between August – October. Traditional habitat was dense scrub or hedgerow. Peak activity from dawn and the following two hours. we humans are devastating to all other forms of life. it is so sad that we are in the midst of a human driven mass extinction of so many other forms of life. that’s what the statement is about on my sidebar about the table of life and how many legs it needs to stand.